Giorgos and Nikos Papaioannou are coming from Athens / Greece and represent the younger generation from their country that has equal experience in classical music and also traditional & folk music. 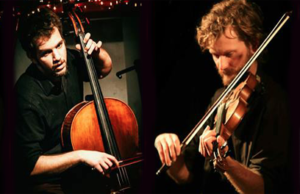 They will present a duet for Cello and Violin, as well as other instruments, in an mood for atmospheric acoustic and minimal sound and plenty of improvisation. They will play part of their favourite common repertoire, which includes traditional tunes and a wide range of contemporary compositions, as well as their own. 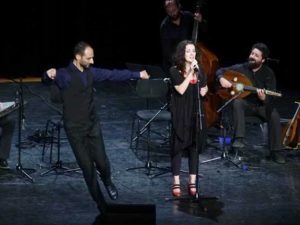 Katerina Papadopoulou (voice, oud, percussion) is considered as one of the very few singers in Greece who still continue the art of the old masters of traditional singing. She has an exceptional fluency in moving between different vocal styles and combining them with her unique vocal and musical expression. Chariton Charitonidis (dance, bagpipe, flute) is a dancer and musician very active in teaching dance seminars in Greece and abroad. Furthermore, he is an active member of the Study Group on Ethnochoreology, within the International Council for Traditional Music (ICTM), carrying out presentations, scientific articles and research projects regarding dance. The duet will “move” inside the traditional genres of Greece. They will present songs and dances from Asia Minor, Thrace, Macedonia, Black Sea and Cyprus. The duet will be accompanied by Efren Lopez.